Perfect way to start or end your day. Life is not perfect. We long for peace, yet we face challenges and changes. We feel responsible to promote harmony, and then when conflict arises, we feel guilty. We feel we've failed. We want to pull the covers over our heads and drop out. But God--through his grace--makes a way for us to go on. Rain falls but the sun rises. Day follows night. Spring follows winter. We grow in grace and faith as we confront our challenges. Grace means receiving something we don't deserve. After all, we are guilty of sin--every one of us. Yet God loves us. He carries our guilt and shame so that we don't have to. He provides for our every need even though we don't deserve it. He uses life's challenges and changes to built our character and draw us to himself. We can throw off the covers and face the world with confidence. We are not alone. God offers us his divine love and protection. That is what this book is about. On these pages we share stories of how God has made a way for us by his grace, and we pray that you accept that grace to meet your own needs. Each reading offers a Guilt Trip to Avoid, a Scripture verse, a story, and a way to Take the Joy Ride. Read one devotion a day, meditate on the message, and apply it to your life. Women today are busy, stressed, and guilt-ridden, yet they long to develop their spiritual sides. 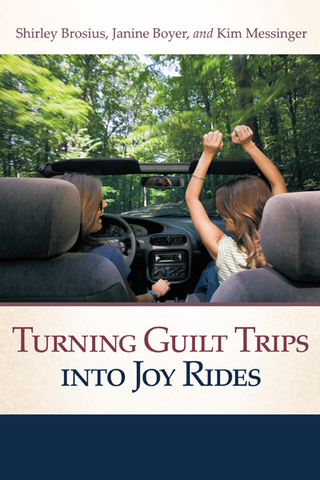 Turning Guilt Trips into Joy Rides offers inspirational thoughts based on scripture--brief enough to be read during a television commercial, yet insightful enough to open your eyes to the grace of God on days you change diapers and/or lead corporate meetings. The book includes six months of daily readings so that you may establish a habit of connecting with God. Readings are listed under leetters of the acronym G-R-A-C-E, representing God, Relationships, Acceptance, Challenges and Emotions.